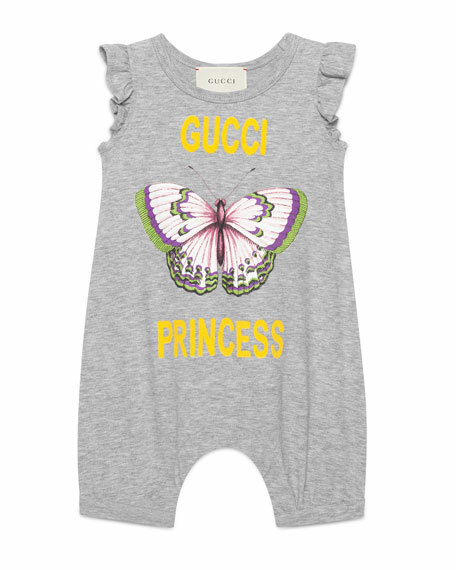 Gucci romper with "Gucci Princess" text and butterfly printed front. For in-store inquiries, use sku #2384242. Alice + Olivia "Mariska" floral-print ruffled skort romper. V-neckline. Short layered sleeves. Smocked waistline. A-line silhouette. Relaxed legs. Tiered ruffle hem. Exposed back zip. Viscose, shell/combo. Polyester/spandex, lining. Made in USA of imported material. 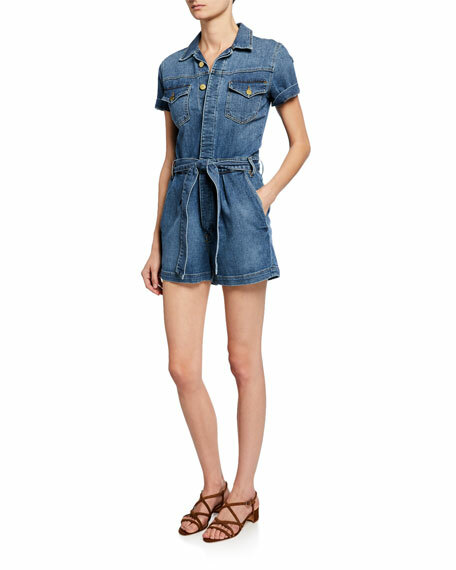 FRAME denim coverall romper. Spread collar; button front. Short sleeves. Chest flap pockets. Self-ties at waist. Side pocket; back welt pockets. Step-in style. Cotton/polyester/spandex. Polyester/cotton lining. Machine wash. Imported. 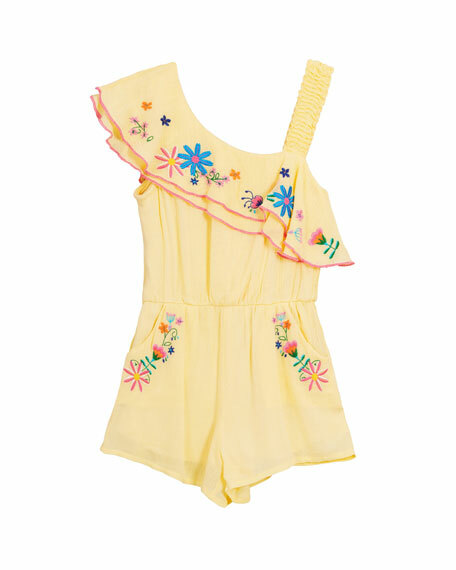 Hannah Banana woven romper with floral embroidery. One-shoulder neckline with tiered, ruffle overlay. Short sleeve at right; wide, elasticized strap at left. Side slip pockets. Rayon. Imported. 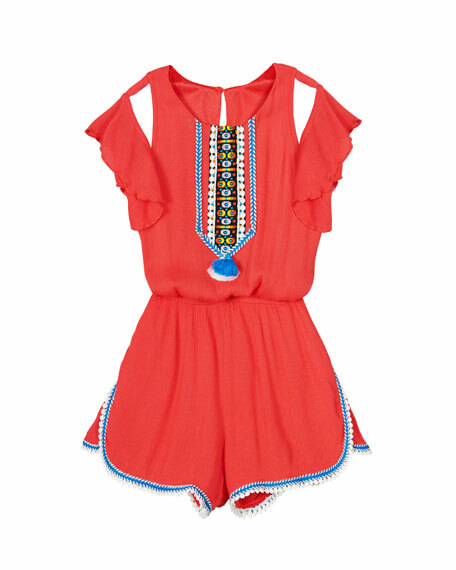 Hannah Banana woven romper with tassel trim. 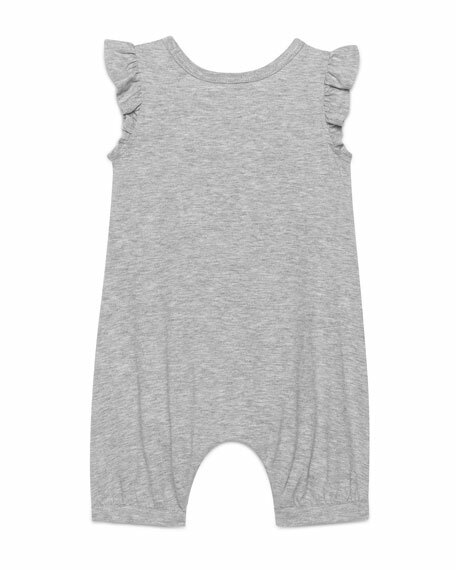 Round neckline; keyhole-button back. Short flutter sleeves. Cutout details at shoulders. Braided and embroidered panel at chest. Pompom tape trim at hem. Cutaway side hem. Rayon. Imported.